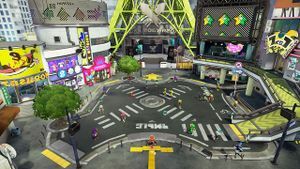 Locations are areas that exist in the universe of Splatoon and Splatoon 2. For a list of playable arenas, see stages. 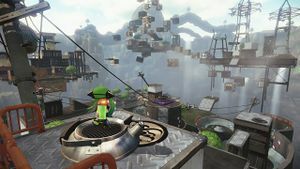 Octo Valley is a hidden valley located near Inkopolis, which serves as the setting of the single-player mode of Splatoon with the same name. This valley is the home of the Octarians where they live in domes accessible through kettles. 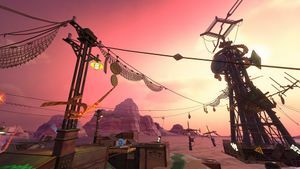 Octo Canyon is a hidden canyon located near Inkopolis, which serves as the setting of the single-player mode of Splatoon 2 with the same name. This valley is the home of the Octarians where they live in domes accessible through kettles. The Deepsea Metro is a subway system running deep beneath Inkopolis that serves as the mission hub for the Octo Expansion in Splatoon 2. Calamari County - Mentioned as being Callie and Marie's hometown. Arowana Castle - Mentioned in the fifth session of Marina's chat room. Mount Nantai - Mentioned by the Squid Sisters, Off the Hook and Cap'n Cuttlefish in Splatoon 2. It's stated to be near Octo Valley.